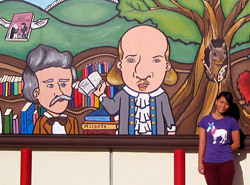 Michelle, 17, helped paint a mural on her city's library and gave a boring street a literary-themed facelift. I liked the design for the mural, which showed scenes from famous books and authors’ faces, but I wished that I gotten a chance to help in the design process. I’m hoping that if the committee can raise funds to replace the mural in the next few months, I will get the chance to give something of my own to Temple City. Ten years later, teens say they have a better understanding of the attacks.